Wyatt LeFever (left) helps Berry Water Gardens employees separate fish and bullfrogs. It all started in the 1940s, and it started with bullfrogs. Like many people in the south, E.W. Berry (great-grandfather of the current owners of Blue Ridge) enjoyed the occasional meal of fried frog legs. However, you couldn’t swing by the grocery store and pick up some frog legs for dinner, you had to harvest them yourself. 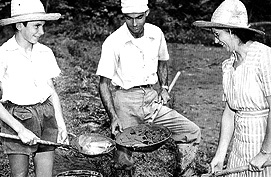 Harvesting bullfrogs, a practice commonly known as “frog gigging”, was a dirty and time-consuming endeavor. A few hours could be spent walking along creek banks, searching for frogs, with only 15 or 20 frogs to show for your efforts. E.W. sensed an opportunity. He decided to raise his own bullfrogs in captivity, and sell them to his friends and neighbors. 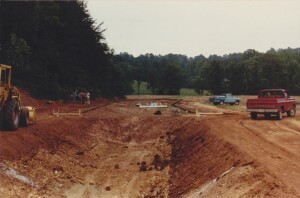 He dug a few small ponds with a mule and dirt pan, filled them with water, and stocked them with bullfrog tadpoles. As the tadpoles matured into frogs, E.W. purchased some feeder goldfish from the local dime store to feed to the frogs. After some initial success, the frogs steadily disappeared from his ponds. The goldfish, however, hung around and continued to reproduce. E.W. 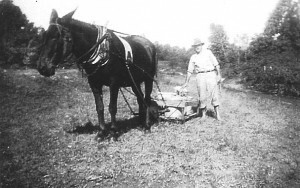 Berry with mule and slide cart, used to transport bullfrogs and tadpoles across short distances. Out of frogs and with no other options, he began to harvest the goldfish and sell them back to the local dime store. And so Berry Water Gardens, the first aquaculture business of our family, was born. Berry Water Gardens evolved into a wholesaler, delivering goldfish, tropical fish and hard goods to pet shops and chain stores. They serviced 8 states and employed over 50 people, reaching their peak in the 1960’s. 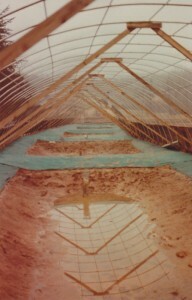 Early construction of our first greenhouse-covered ponds. Wyatt LeFever, grandson of E.W. Berry, had been working full time as a buyer and grower for Berry Water Gardens. Convinced of the growth potential of the ornamental fish industry, he started his own business, Blue Ridge Fish Hatchery. After a few years spent developing his goldfish stock, Wyatt began looking for ways to expand his product line. He learned of beautiful and colorful pond fish, known as “nishikigoi” or “koi”, that were being raised in Japan. In 1965, he placed an order for 300 three to four inch Japanese koi. After a few days in transit, they arrived in North Carolina with only 10% of the shipment alive. Wyatt placed what was left of the shipment into a pond to grow out for brood stock. Of the original 300 koi, only three survived to sexual maturity. A few years after their arrival in the U.S., the three surviving Japanese koi were used to spawn Blue Ridge’s first crop of koi. The initial reaction from businesses in the water gardening industry was disappointing. Although the koi were colorful, no one knew what they were or how to care for them. Interest was slow and sales were low. Wyatt was undeterred. He continued to spawn and raise new crops of koi, selling what little he could to keep his business afloat. After years of declining sales, Berry Water Gardens shut its doors, allowing Wyatt to concentrate full time on his new passion, farming and raising koi. In 1975, Wyatt’s brother, Rick, and his oldest son, Randy, joined the company. By this time, knowledge of koi had spread throughout the pond and water gardening industry, and the demand was steadily increasing. Blue Ridge was positioned to be the leader in a burgeoning market. Patrick County, our flagship production facility. Once a cabbage farm, over 20 years this land has transformed into a state-of-the-art koi farm, with 64 ponds and over 50 surface acres of water. 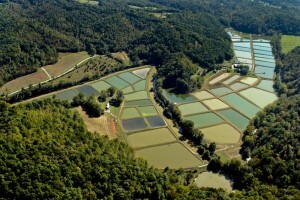 The next 15 years saw rapid growth of the koi and goldfish industry, with Blue Ridge Fish Hatchery leading the way. In less than 3 decades, Blue Ridge had grown from one man’s start up, to a national supplier of koi and goldfish, employing over 20 people and shipping koi and goldfish to all 50 states of the U.S. In the early 1990’s, we once again changed the face of the koi industry, when we crossbred koi with long-fin Indonesian carp to create what are now known throughout the industry as “butterfly koi”. Read more at The Butterfly Koi Story. Today, Blue Ridge remains a leader in the koi and goldfish industry. With over 200 ponds across 6 farms, we are able to provide a steady supply of high quality koi, butterfly koi, goldfish and cold water ornamentals to businesses across the nation. As a family owned and operated business, each of our employees takes great pride in delivering a healthy, high quality product coupled with top-notch customer service. Give us a try today, and you will see the difference.